2012 was Ladro’s first full year as a coffee roasting company. We delved deep into our limits and resolved to find the best coffees, do them justice in roasting, and share them with our customers. As we moved forward, a lot more changed than just the coffee. More than ever we’ve got a team of enthusiastic, professional baristas who are excited to handle our unique coffees with great care and precision, delivering them to customers with thoughtful hospitality. To answer the call of this heightened ambition and challenge ourselves a step further, we’ve decided to embark on yet another Ladro first: the journey of coffee competition. For the first time ever, Caffe Ladro Espresso Bar and Bakery will be entering the Northwest Regional Barista Competition and Brewers Cup at the end of this month! The NWRBC is one of six regional events held by the Barista Guild of American and the Specialty Coffee Association of America. These occur over the course of several months and all seed into the United States Barista Competition and Brewers Cup, which ultimately crowns the winner to represent the US at the World level. It’s intense, to say the least. Director of Education, Laila, describing TDS to a barista. 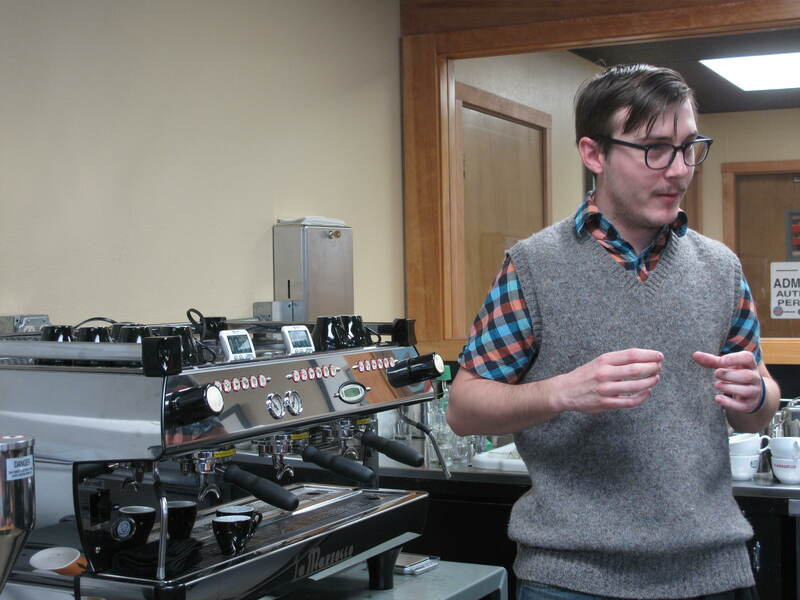 Shane, the Educator of the Lower Queen Anne location, talking abou the coffee he will be serving. 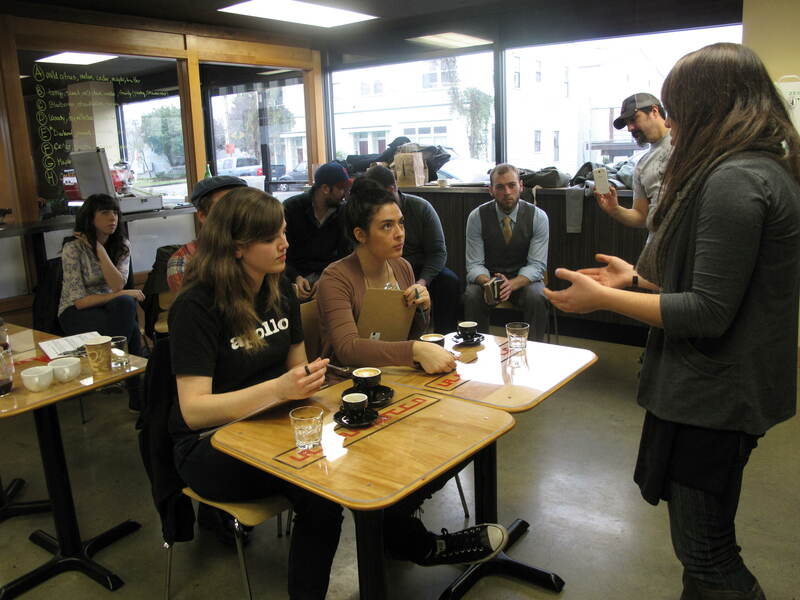 Sam, a barista at our Lower Queen Anne location, talking about the flavors in her espressos. This week Caffe Ladro held an in house competition open to all of our barista staff to determine which of our many qualified baristas would push hardest, take it most seriously, and earn the honor to represent us at the regional event! We held two separate events: Barista Competition and Brewers Cup. Barista Competition routines require creativity, planning, attention to detail, and pure charisma. Baristas serve three beverages (single espresso, single traditional cappuccino and a signature beverage) to four judges. A head judge keeps the other four calibrated, and also two technical judges keep an eye on things like waste, cleanliness, and speed. Baristas have fifteen minutes to serve the twelve (minimum) drinks while also talking about the coffee, explaining to the judges what they will be tasting and why, and all the while doing their best not to spill, smudge, or lose composure. The experience is demanding; often competitors’ hands can be seen vibrating and it’s only sometimes from caffeine. The Brewers Cup emphasizes brewed coffee rather than espresso: competitors are required to manually brew three separate cups. In the first round, competitors are given a coffee which they must prepare and serve to three judges without knowing where it’s from, who roasted it, or otherwise any information about it. They must rely on their taste and experience to find a brew that they think best highlights the coffee’s attributes. In the second round, those who best perfected their first round brews move on and have the opportunity to share with a judges a coffee of their choosing. Along with this, they are required to introduce the coffee, often drawing on information about the roast, producer, varietal, processing, and so on. 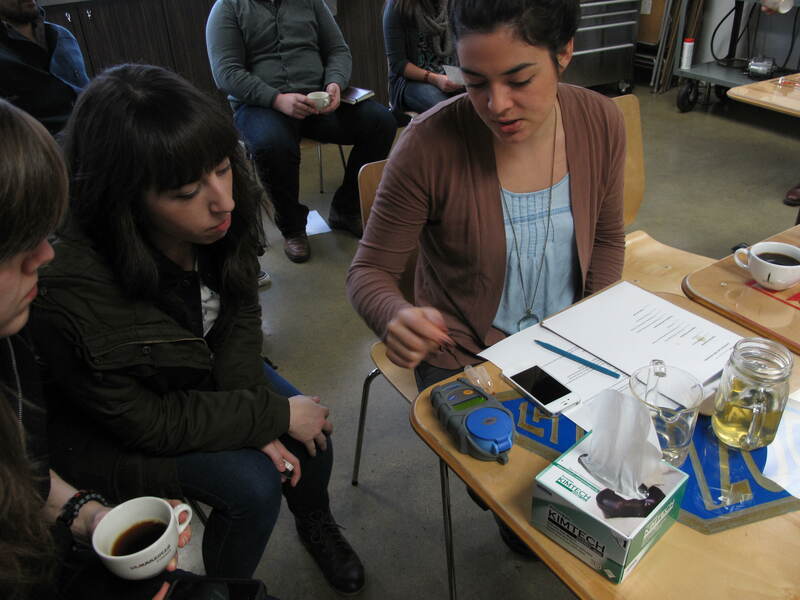 Judges consider coffee complexity, quality of brew, professionalism, and overall experience as they tally scores. In our condensed version of these two competitions, we had a great group of baristas duking it out for the winning spots and, after careful deliberation, our competitors were decided! This entry was posted in Caffe Ladro on January 8, 2013 by Caffe Ladro - Ladro Roasting.